We’re nearly half-way through the 2015-16 season, but the Calgary Flames have yet to play the Los Angeles Kings. But these old friends will renew acquaintances tonight as they polish off each other’s respective 2015 at the Scotiabank Saddledome. The Flames and Kings played a bunch of really important games against each other last season, including Johnny Gaudreau’s first career hat trick last December 22 saving Christmas and a playoff-like April 9 game resulting in a 3-1 Flames win and their first playoff berth in eons. The Kings are a much more resilient team this season and sit atop the hapless Pacific Division by virtue of being the only true “good” team in the bunch. 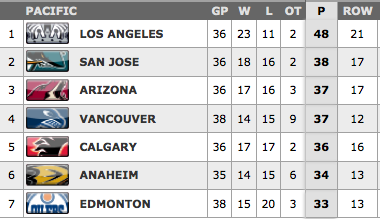 The Kings will be sore about leaving so many points on the table against the Flames last season. The Flames should be sore about not adapting to the Ducks neutral-zone pressure last game and letting points slip away. It should be a good tilt to end the calendar year on. The puck drops at 7pm MT on Sportsnet 360 (and Sportsnet One) and Sportsnet 960 The Fan! 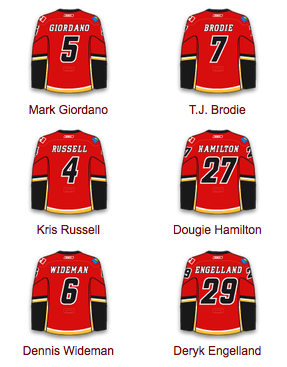 It sounds like Karri Ramo will get the nod for the 26th time this season (and the 23rd time since Halloween). He’s 13-11-1 with a 2.68 goals against average and a .908 save percentage. He allowed just a single goal against the Ducks on Tuesday night and was not, by any stretch of the imagination, the reason they lost. And to be honest, given how little the Flames showed offensively, he would’ve had to be insanely good for the Flames to have won that game. And despite being largely invisible and a non-factor in his 9:20 of ice-time – the least of anybody on the team – Bollig’s back in the line-up because the Kings are a big team, and Mason Raymond’s perimeter speed is in the press box (and so is Josh Jooris for that matter). The Flames are 14-9 with Raymond in the line-up and 7-12 with Bollig in, and Raymond plays a lot more than Bollig does when he does dress. For what it’s worth, Johnny Gaudreau’s 8 points against Los Angeles is the most he has against any NHL team during his short NHL career. And he’ll have to be good tonight, as the Flames seem unable to generate any offensive pressure if #13 is on the bench or off his game. The Ducks sicced Carl Hagelin on him on Tuesday and largely kept him off his game, and I’d expect the Kings to match up their third line so Dustin Brown can pester him throughout the proceedings. The Flames failed to generate serious pressure on the power-play against Anaheim, but their penalty killing has continued a pretty nice run, as they have prevented power-play goals against for their last seven games. If they want to give themselves a chance to win, staying out of the box and preventing those types of opportunities would be a big step in the right direction. 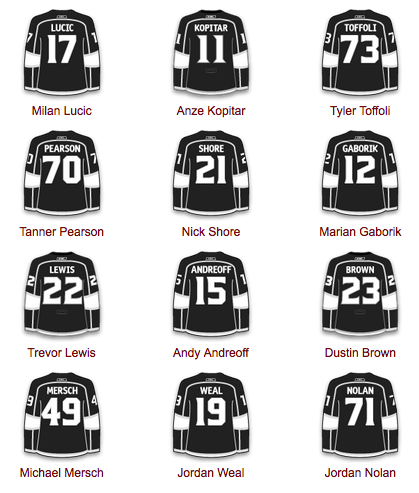 Jonathan Quick gets the nod for Darryl Sutter’s squad, making his 31st start of this campaign. He’s 20-9-1 with a 2.20 goals against average and a .921 save percentage. He is one of the league’s tippity-top goalies, and he’s bolstered by a pretty solid defensive group boasting the likes of Doughty and Muzzin. 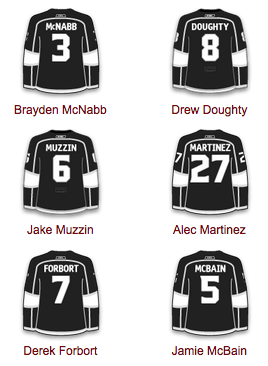 The Kings have seen their depth tested a bit this season, as they’re currently without Kyle Clifford, Dwight King, Jeff Carter and Matt Greene, but they’ve managed to slot bodies in from the AHL’s Ontario Reign and keep chugging along. And what can we say about the Jolly Rancher’s crew that hasn’t already been said? They were a strong team last year that figured out a way to lose just enough close games to miss the playoffs. Now that the off-ice distractions seem to be behind them, the Kings are playing just as well but seem even more focused than they were last year. Expect a business-like approach from the former two-time Stanley Cup champions. 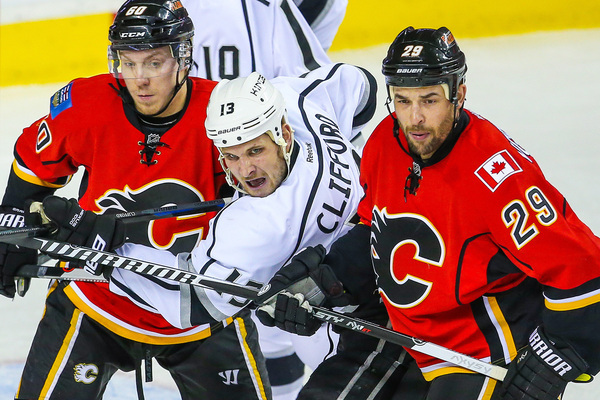 The Flames and Kings played five times last season, with Calgary winning four of those games. Every game was decided by one or two goals. All-time, these classic Smythe Division rivals have met 226 times in the regular season. The Flames hold a sizable 116-85-21-4 edge against their regal counterparts. and they could win a prize worth $5,000. Nominate your hero by clicking this link! The Flames finish off the 2015 calendar year with a pretty big divisional game against a team that they knocked out of the playoff picture last season. Coming off a tough loss to Anaheim, both teams will be amped up and hoping for two key points in the playoff race. Gio! It won’t be a shutout! Yes, Gio and not a PP goal! There should have been a Kings penalty there. Gaudreau was hooked down pretty badly at the blueline. Edit: Saw the replay, I was mistaken. Flipping to the Oilers games during commercials. Looks like they are playing the same trap game again. 1-0 score too. Big powerplay here, especially with it being Doughty getting the boot. Really need a goal here. Hurdler has been bad Ferland and Bennett are on the second unit who do you suggest they puy out there? Um, Ferland or Bennett… The most successful powerplays in the league load up their 1st unit. Ok who would your second unit be? The leftovers. Something like Frolik-Granlund-Hudler. The idea of a powerplay is to score and that’ll, in theory, happen more if your best players are out there. Obviously I mean when he’s healthy. Right now you’d probably have to put Colborne there, and I’m fine with that. My point is the he should not be on the 1st unit. Good PP with some good chances but unfortunately no goal. Quick has been too good. Need Frolik back in the worst way. Ortio having a good game so far tonight for the Heat who are up 1-0 on a goal from Agostino. Kylington with an assist. Well that’s the game unless they can score a short-handed goal. Wow what a sobering couple of games. We still don’t stack up against larger teams. Ugh..I don’t know. Can Bob for something to do. Flames really lack secondary scoring. 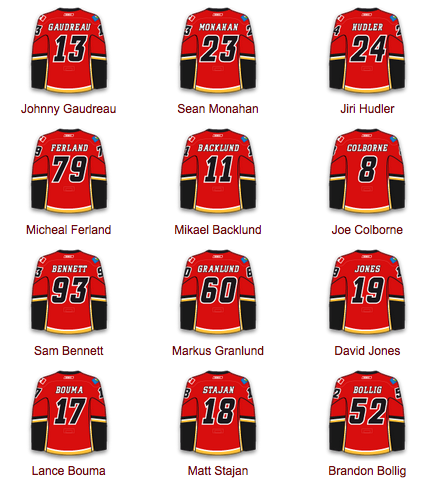 If the Monahan/Gaudreau pairing doesn’t score, the club is hard pressed to find any scoring. Hudler has been invisible; as has Backlund, Colbourne, Jones and just about every other forward who is counted on to chip in. The opposition knows if you take JG and Monahan out of the game, your chances are good for a victory. Any coincidence Bollig comes in for a couple games and we lose both? Hartleys love affair with Bollig the Slug keeps Bouma and Stajan below 10 minutes and effectively makes us a 3 line team once more. Mod Edit:No need to resort to namecalling, it doesn’t add to the discussion. Don’t insult Bob. He’s the reigning CotY after all. What is it with you haters tonight. Bollig and bouma had as much or more pressure than any other line. There is more than enough blame to go around. How many goals was JG on for? Not sure, how many goals was Joe C on for? Can’t really use that, bud. Joe did have an assist on the only CGY goal. Yep thats my point. He gets dumped on all the time and actually contributes. Didn’t say Bollig was the reason we lost did I monty? asked if it was any coincidence. Can one of the states guys answer that . I know JG was on for 3 goals and definitely coughed the puck up for the 4th. But I’m ok with that, the team is learning. As I said there is lots of blame to go around. We have a long ways to before were standing toe to toe with LA or the Ducks. We aren’t haters, we’re acknowledging things that were done, in our opinions, incorrectly. Putting Bollig in the lineup and having Colborne (and Wideman IMO) on the 1st PP unit are not things that should happen. I just don’t think you actually watched the game or judge the player on the actual game because you want to continue with your rants. They have tried just about every combination the last two games none of it has worked. Colborne or Bollig were not the problem tonight. That’s a part of the problem. Them trying so many combinations. Hartley doesn’t allow any unit to mesh because he changes everything before they can. I’m almost certain that, given time to mess, a PP unit of Gaudreau-Monahan-Bennett, Hamilton-Brodie, would be extremely potent. Instead of trying that, though, Hartley also resorts back to players like Colborne, Wideman, and Raymond when he’s playing. The use of Bollig cost the Flames the game? Really? No doubt he didn’t add much (if anything) but blaming him for the loss is a stretch. Let’s look at the players counted on to score (two games and one goal). And your comments about Hartley are uncalled for. No I just like intelligent discussion and struggle with stupidity. Am I reading this right??? Is this grade one?? Did you mod someone for calling a slow skater a slug? Or did I miss another part of the comment? Alright, I’ll show myself out. Sorry, just not in a good mood and tripleposting and will go to bed now. Poirier with a goal! Kylington also with another assist! In other exciting news, Carrie Underwood in NY Times Square for NYE celebration while hubby Mike was losing out against Dallas…..
Nope, we don’t quite stack up to California teams yet..need more beef! Sorry ol’ Tom, didn’t mean to tag your comment! unintentional..
No worries. I was little confused but no harm done.